Mary Jean was a teenager when she began working at a guesthouse owned by her uncle washing dishes and cleaning rooms. Often the guests would ask her what the underwater world was like, but she was unable to respond. Many people flocked from around the world to see the underwater treasures of her home called Apo Island in the Philippines. However, with regret, she had never seen it. Only divers could see the underwater world, and diving was expensive. She often dreamt of submerging herself in deep blue to see what this thing called ‘diving’ was all about. Such was this mysterious place that only a privileged few were allowed there. They seemed to enjoy it. Otherwise, they would not travel to her island and keep coming back to dive again and again. Spanish. American. Australian. They just kept coming, and they always asked the same question, what is the diving like? She was disappointed that she she was never able to answer this question. As time went on, she became more curious about the deep blue. Her father was a boat captain and she did like the sea and to explore, and she desired to travel the world one day. Her fascination grew every time she heard tales from visitors about schools of jacks, barracudas and giant triggerfish that filled the depths of the sea. Then, one day, her uncle asked if Mary Jean would like to train as a dive master. She was very eager to do it, but she quickly realised how hard her journey would be. 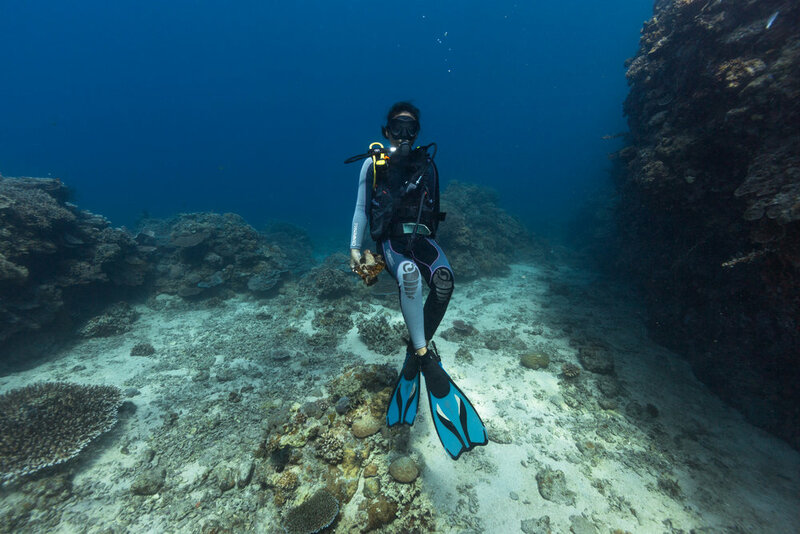 It was not the bookwork or the exams she needed to pass to become a dive master, or that she felt anxious on her first dive – it was because she felt that she could not do it. Mary Jean was a girl: this meant she would be judged for many reasons. Firstly, she would develop a tan, which was taboo for girls on the island. It was not in fashion to have a tan. The general fashion was fair skin. How could a girl find a boy, if she did not do all she could to look beautiful? Her girlfriends had already begun to dream about love and had already begun to have babies from as young as the age of 14, so there was little room in a woman’s life for the ocean. It was also custom for men to become dive masters, boat drivers and snorkel guides. Jobs on the ocean were not designed for females. Women felt their natural place was in the kitchen, not in the sea. Indeed, one of her female cousins had asked to join the snorkel guides, but had been rejected because it was ‘inappropriate’ for girls to swim with men. The big concerning question on the minds of the men, who ran the snorkel tour was – what indecencies could occur if a girl led a man out on the sea? The simple answer was - it is best we never find out. It was not only the threat of scandalous relationships arising between men and women that was a concern. When it came to becoming a dive guide, there was also the issue of lifting heavy objects like tanks. Women were weaker than men. Surely, they would struggle with the task? All of these worries, the gossip, the fear of being different, of being judged weighed heavily on Mary Jean’s mind. The pressure built up in her mind so much so that she decided she should give up her dive training entirely and just drop out. Perhaps, diving was not for her? One day during training, she became very frustrated with doing her underwater exercises and so shot up to the surface at about five metres. She was upset with herself, with life, the things men said, with the pressure, and was not sure whether she should continue. After all, she was a girl. But, something inside Mary Jean told her not to give up. She had the support of many mentors, including her uncle, Mario Pascobello. He was the one who had offered her an opportunity to become a dive master in the first place. He had aspired to launch a novel policy on the island, which gave girls and boys the equal opportunity to learn to dive – and Mary Jean was a beneficiary of this. This is because Mario believed that men and women were equal. He was also a man who had the dream to save the planet, and to do this he needed both sexes to help him. He sought assistance from a group of French Divers, Plounge du Monde, who had come especially to the island to give less privileged youths a chance to break free of the social barriers that keep young people from achieving their dreams. So, with the help of the French, Mary Jean grew from being a teenager unsure of her capabilities to recognising her full potential. The kind foreigners even dug deep into their own pockets to pay for thousands of dollars for the young peoples’ dive certificates and treated her class as if they were their very own children. The teachers sang Korean karaoke with the youth and gave them chocolate treats. Finally, in April 2017, Mary Jean (and her close friend named Shim) graduated as the first female dive masters on Apo Island in the Philippines. Their graduation took place at the village basketball court. There was a pig roasting on a spit, children running around and tripping over stray dogs, while young girls danced to disco music dreaming of meeting their future husband, as all young girls had been born to do on the island. The guests drank sodas and fluorescent pink and blue cocktails. It was a grand celebration planned by her mentors as a special gift for her dive class. Even the Vice Mayor of Dauin was there. Officials from far and wide gave her class of dive masters and rescue diver graduates a round of applause. Mary Jean cried and cried. She was so elated because this was a most special day. She was also sad because her foreign mentors, who had nurtured her through her highs and lows, were finally leaving. They were about to board a boat to go on a new mission and help another young Mary Jean. For Mary Jean, this moment would change her life. She had achieved something that had never been done before. It was a Cinderella moment (without the Prince charming factor), which could change the life of not just Mary Jean, but of all girls on Apo forever. It is yet to be seen whether the younger girls so keen to dance that night paid attention to Mary Jean’s tears. Hopefully, they felt the significance of that warm balmy night. Finally, Mary Jean and her girlfriend, Shim, had shattered the fantasy of the glass slipper. They had shown the world what woman can do.